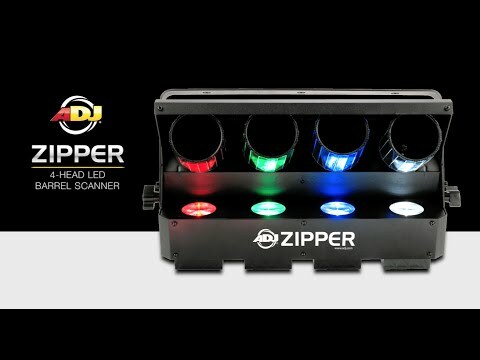 Create pure lighting excitement with the ADJ Zipper, an ideal lighting effect for any mobile entertainer, small nightclub, bar our lounge and for Bowling and entertainment centers. This fixtures features four barrel mirrors, 8-Watt LEDs and 16 exciting built-in lightshows, all in a compact fixture. The red, green, blue and white beams swivel back and forth and create multiple beams that cover a wide area. 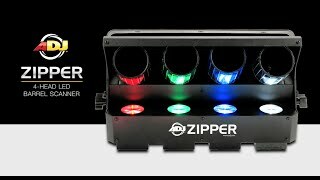 Considering purchasing the American DJ Zipper? Have questions? Ask people who've recently bought one. What flight case or bag is best for two of these? Do you own the American DJ Zipper? Why not write a review based on your experience with it. Seen a video for American DJ Zipper online or have you own video? Check out American DJ Zipper on DJkit.com!